At the heart of Marennes-Oléron’s basin, the ocean and the land keep interacting. The two elements are symbolic in the region. They meet and separate according to the rhythm of the tides. The Geay family has been established there for five generations. The Marennes-Oléron’s basin is conveniently situated in-between the Atlantic ocean, Oléron island and the river Seudre. The situation is ideal as the ocean drags water very rich in sediments and phytoplankton. 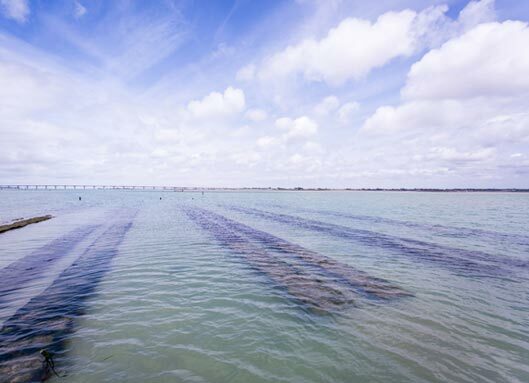 The perpetual movement of the tides sets the rhythm for oyster producers and the growth of Geay Oysters. When the tide is low, oyster parks are reachable to be worked on and when it is high, the parks are covered with water again. The phenomenon happens twice a day with different amplitudes. Nevertheless, what is really special about this area is the presence of « claires ». It is a technical word defining old salt marshes that have been used to refine oysters since the middle of the 19th century. Their ground is made of clay and they are very rich in phytoplankton. This alliance gives a unique taste to Geay oysters.